In most of New Jersey the Common Baskettail (Epitheca cynosura) is the default species, although it has yet to be reported in the southernmost counties. Slender Baskettail (Epitheca costalis), formerly called Stripe-winged Baskettail, has been reported from several counties and should be looked for throughout the state. 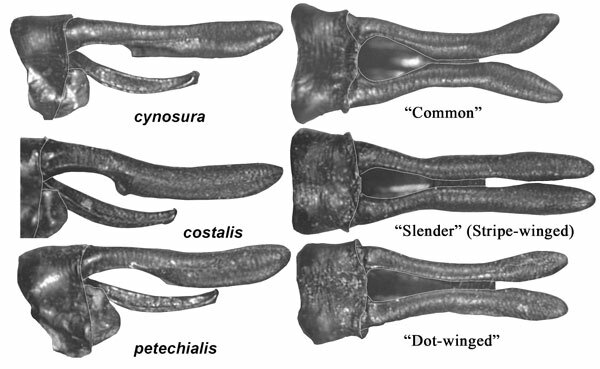 Until recently, little was known about the differences between these species and even now in-hand ID is difficult at best. Field ID is even harder and may be impossible with the current state of knowledge. 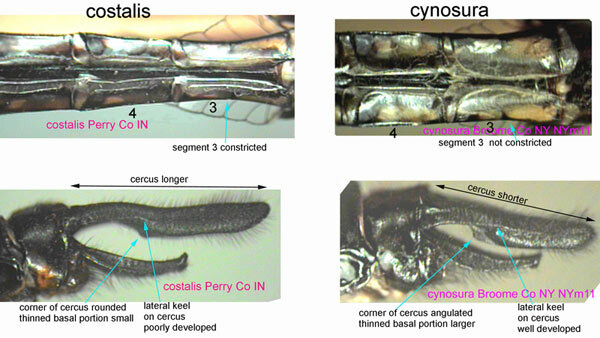 The exact relationship of these species and others within the Baskettail complex is still under review and the ID characters are poorly understood. Note that almost all of these marks are tendencies. Field ID is not going to be very reliable, especially when you must consider Spiny and Beaverpond Baskettail. To some degree the marks mentioned above may pertain to Texas specimens. To my eye, our Common Baskettails seem to have rather parallel-sided abdomens, with Beaverpond exhibiting a "spindle" shape. Following are two sets of scans from Nick Donnelly which show the differences in S3 and the cerci. The second set includes Dot-winged Baskettail, which doesn't occur in New Jersey.